Kiowa pushes a barge through canal with electric barrier. President Donald Trump’s 2018 budget plan eliminates a $300 million program to restore the Great Lakes. The plan is sparking concern among environmentalists, because a lot of that money is used to protect the lakes from the invasive fish known as the Asian carp. Some varieties — like the Bighead and Silver carp — grow up to 100 pounds and eat their weight in plankton every day. That leaves much less food for other fish. And with invasive Asian carp spreading out in the United States, they’re common in the Mississippi and Illinois river systems. That’s why the battle to control them is being fought near the southern tip of Lake Michigan. "We're the defensive line in preventing any future movement toward the lake of the fish," said Chuck Shea of the U.S. Army Corps of Engineers. He supervises a project that has already spent nearly $18 million from the Great Lakes Restoration Initiative for an underwater carp barrier. The barrier is in the Chicago Sanitary and Ship Canal near Romeoville, Illinois, about 40 miles southwest of Chicago. At the bottom of the canal, steel electrodes create a pulsing electric field to deter carp from entering. The Corps of Engineers is upgrading the original barrier, one of three at the site. Shea said the work will strengthen the system. "We've learned that the power levels that the demonstration barrier can operate at limits its effectiveness," Shea said. "It's effective on larger fish, but it is not effective on smaller fish. So, by upgrading it, we can make it more effective on a wider range of fish." Construction won't be affected by Trump's plan to eliminate the $300 million in the Great Lakes Restoration Initiative. But another half-million dollar for a follow-up study is in doubt. That study would look at ways to prevent Asian carp from being dragged or pushed through the barrier by barges. Likewise, other agencies using federal funding might need to halt their work or need to look elsewhere for money. "Great Lakes Restoration Initiative dollars are critical to the effort to keep Asian carp out of Lake Michigan," said Molly Flanagan of the Alliance for the Great Lakes. "Funding from the Great Lakes Restoration Initiative goes to the Illinois Department of Natural Resources to help with their harvesting effort to reduce population and the pressure that fish experience to move closer to Lake Michigan," she said. "Funding for the Great Lakes Restoration Initiative goes to agencies like the U.S. Geological Survey and the Fish and Wildlife Service that are doing different studies to find out what technologies might be useful in the battle against Asian carp." And, Flanagan said, if the pot of money goes away, it would be tougher to get funding for stronger protections 20 miles downstream from the barrier, at the Corps of Engineers Brandon Road lock and dam. Environmentalists want more safeguards at Brandon Road, which is about 10 miles from the leading edge of the Asian carp invasion. But the Trump administration is delaying the release of a study on carp control options. That’s good news to Lynn Muench of the American Waterways Operators. 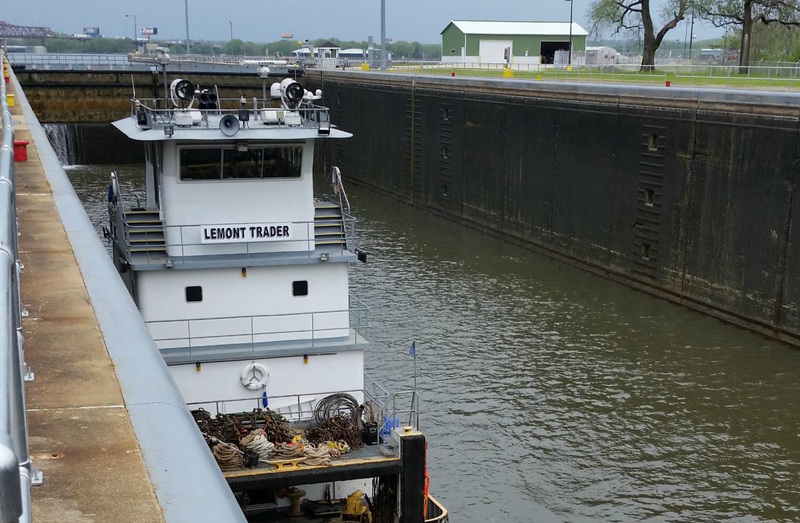 According to the tug and barge trade group, additional structures at the lock could slow commerce. The group supports federal money for some research and for harvesting carp from the Illinois River, but Muench said other spending should get a close look. A bipartisan coalition in Congress backs the restoration initiative, so Trump may not be able to zero out the program. Congress can modify Trump's budget plan. But environmentalists say a big reduction in spending could still hurt efforts to halt the Asian carp. Editor's Note: This story is part of a series from Great Lakes Today, which is funded through a grant from the Corporation for Public Broadcasting.